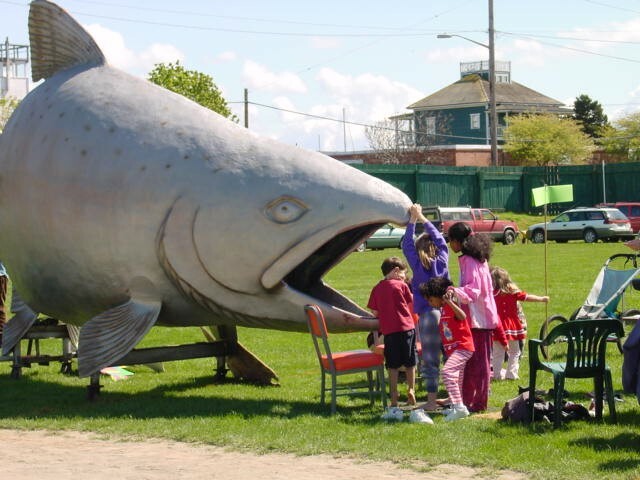 Celebrate the return of salmon to the Puyallup River Watershed at the Salmon Homecoming on Oct. 11. This family-friendly event features guided tours to watch migrating salmon in Clarks Creek, tours of the Puyallup Hatchery, science and art activities for kids, a Native American welcoming ceremony and storyteller, music from a live bluegrass band and a DJ, and a photo booth as well as “selfies” with Fin the fish. This free event runs from 11 a.m. to 3 p.m. at the Puyallup Hatchery, 1416 14th St. SW in Puyallup. After the Puyallup Tribe of Indians gives a welcoming ceremony at 11 a.m., Pierce County Councilmember Joyce McDonald will briefly discuss salmon recovery efforts in Puget Sound. Food will be available for purchase from the Whistle Stop Concessions food truck. Most activities will be outside, so attendees should dress for the weather. In addition to Pierce County Public Works and Utilities, the following organizations are sponsoring Salmon Homecoming: Puyallup River Watershed Council, Pierce County Lead Entity Puyallup and Chambers-Clover Watersheds, Puyallup Historical Hatchery Foundation, Washington Department of Fish and Wildlife, Citizens for a Healthy Bay, Pierce Conservation District, Port of Tacoma, Fix Auto, and University of Puget Sound. These organizations are participating in the event: Puyallup Tribe of Indians, Muckleshoot Indian Tribe, South Sound Salmon Enhancement Group, Foss Waterway Seaport, Wolf Camp and the Wolf College, Puget Creek Restoration Society, and Trout Unlimited. Download the event poster here, or watch the Pierce County TV video clip that announces the Oct. 11 event. You can also watch a two-minute video from last year’s Salmon Homecoming.